On one hand, Peter Tomasi springs a couple of genuine surprises in Superman/Wonder Woman Vol. 3: Casualties of War, such to make the book almost can't-miss reading. 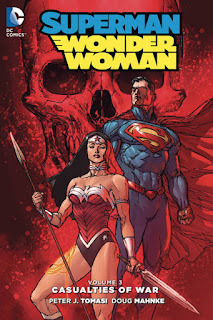 On the other hand, as the incoming writer on the title, Tomasi brings his own take on the Superman/Wonder Woman relationship, and for me it was immediately problematic. I appreciate that Tomasi parallels the change and growth of the characters in the book's superhero plot, but in some respects Tomasi bends the established portrayals of these characters to fit the needs of the story. Most of the problem resides with Wonder Woman, and it speaks to the New 52 era's difficulty overall in establishing Wonder Woman's personality and persona. From the first issue where Diana hurries Clark Kent to finish writing an article so they can go out on a date, I had a sense Peter Tomasi's take on the Superman/Wonder Woman relationship was not going to be for me. It's a cute take, in its own way, with Clark as the flaky, easily distractible bleeding heart and Diana as the focused, down-to-business warrior, a kind of Dharma and Greg for the superhero set. And it works with the book's overall conflict, a villain crazed by the heroes' failure to save his family; Superman learns he has to accept his inability to save everyone, while Wonder Woman has to try a little harder to save everyone ... more so than she already does. That last conceit gets to the heart of Tomasi's difficulty here, where even from the start he demonstrates Wonder Woman as not so concerned with the average person, and yet Tomasi has to clarify that Wonder Woman wasn't going to let an injured man die. Tomasi's Wonder Woman here is the self-proclaimed "god of war," seemingly better suited to "beat[ing] the hell" out of bad guys than taking care of collateral damage. But this is a characterization of Diana that holds up not at all when compared to Wonder Woman's friendship with Zola or mercy for Hera in her own title, and so Tomasi has a tendency to mitigate it around the edges for good measure. The problem is surely greater than just Tomasi's, speaking to the lack of definition Wonder Woman's had in the New 52 era overall. That Brian Azzarello got thirty-five mostly uninterrupted and self-contained issues to tell his Wonder Woman story is an unimpeachable gift, but her lack of interaction with other characters has robbed the rest of the DCU of some idea what to do with her, not to mention there's been no clear telling of how she became Wonder Woman. But I'm not too proud to say there's a whole lot I'm willing to look past for the fact that Tomasi brings Magog David Reid into the New 52, along with perennial Wonder Woman villain Circe. I have significant affection for the oddball Kingdom Come offshoot who became a Justice Society member and star of his own predictably-short-lived Keith Giffen series, and I'm delighted that Tomasi thought to bring him back, and still named David Reid if not with the same origin. Furthermore, while neither Gog nor Magog is the child of Superman and Wonder Woman (as the proto-Magog Wonderstar seems to be for a minute), there's enough twisty ties through Kingdom Come and The Kingdom to make Magog a clever foe for Superman and Wonder Woman together. I also liked, given artist Doug Mahnke's presence, that Tomasi used Major Disaster and that Mahnke could draw him as from Justice League Elite; I admit I'd almost forgotten the time Major Disaster was an interesting perspective character. Peter Tomasi, I state almost incessantly, has been one of my favorite DC Comics writers for quite a while, and again I find Superman/Wonder Woman Vol. 3: Casualties of War tightly plotted. It's a good story -- and, hey, Magog! -- but it's another that trips the third rail that is Superman and Wonder Woman's relationship in the New 52. Unfortunately, if this take on the relationship informs Tomasi's New 52 Superman work leading into Rebirth, or even translates to Tomasi's writing of the pre-Flashpoint Superman and Lois Lane post-Rebirth, that may result in a run that I enjoy less than I'm expecting. One thing at a time, however; it's nice to see Tomasi and Doug Mahnke working together regularly on a title again, at the very least.